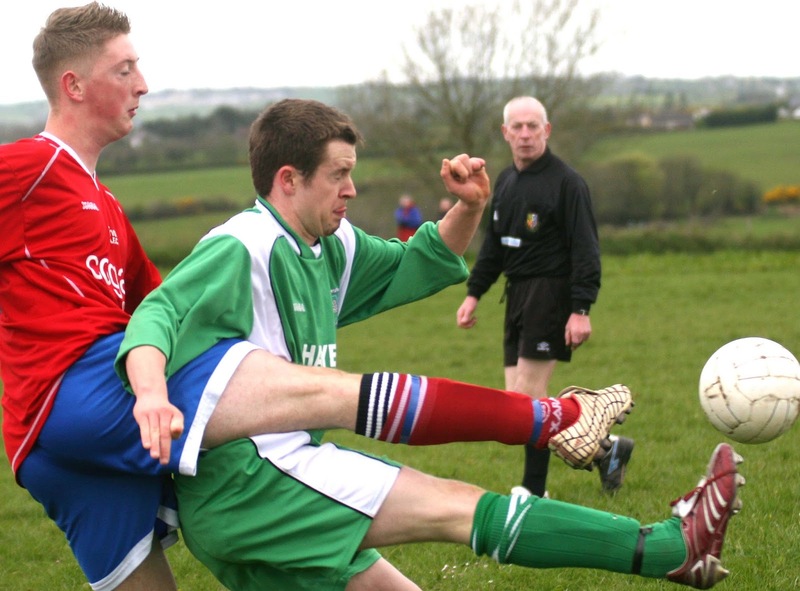 Geoffrey O’Callaghan headed a smashing second half winner as Kanturk defeated Ballyvolane 3-2 in their top four clash in Murphy’s Stout AUL 1A. The win keeps Kanturk’s title hopes alive and puts them in pole position for the runners up medals. 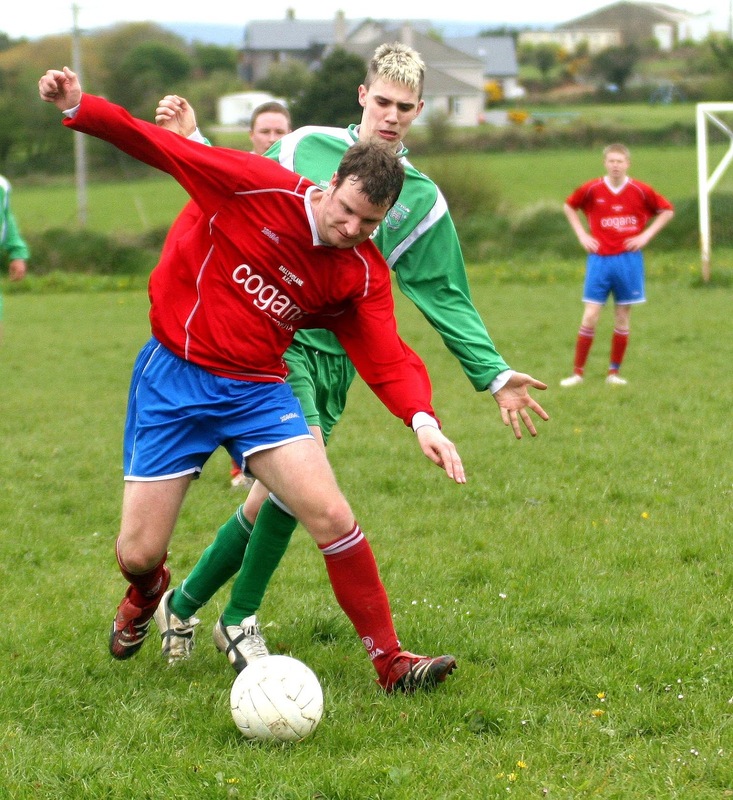 Leaders Castleview were present at the game but left disappointed, as a Ballyvolane victory would have given them the title. 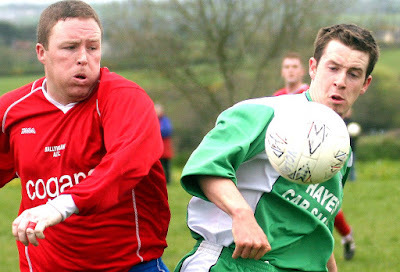 O’Callaghan’s flashing header was about the only highlight of a dull second half, an earlier Ballyvolane equaliser being something of a fluke. 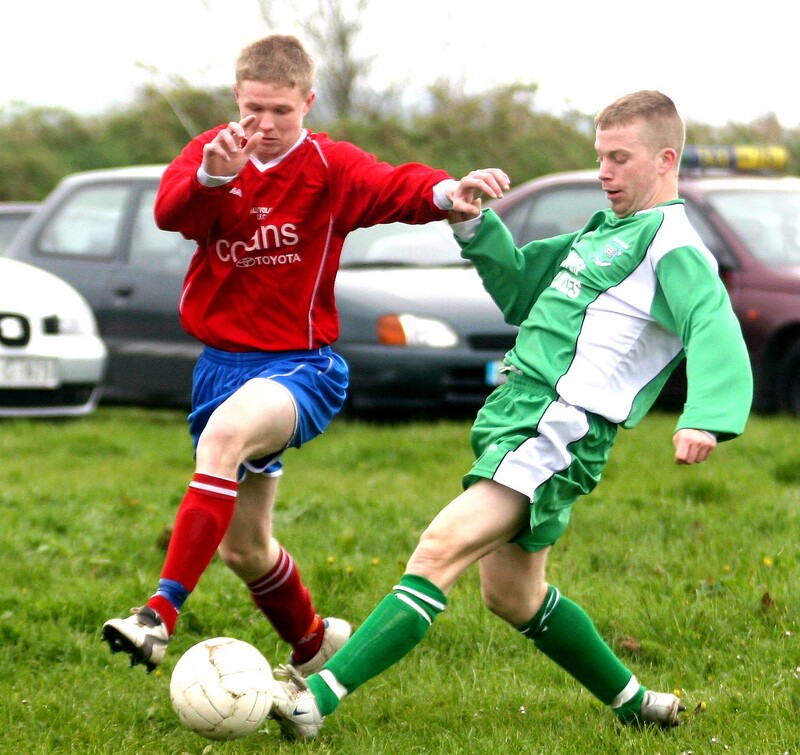 Kanturk had started well and indeed Noel O’Callaghan came very close to giving them a first minute lead. Kanturk, thanks mainly to efforts of midfielder Damien Kelleher, led 2-1 at the break, having twice taken the lead in a first half that wasn't a whole pile better then the second. Noel O’Callaghan’s early chance came after the home defence failed to clear a long free in by Tadhg Collins. In the 5th minute, Eugene O’Sullivan passed forward to Mick Reid. He peeled away from his marker but his shot on the turn from the edge of the box was too high. Ballyvolane weren’t at the races at all in the opening quarter. In the 9th minute, a Collins corner flashed all the way across the goal and, ten minutes later, Jamie Haugh robbed Peter Nugent in midfield and his skilful run to the edge of the box ended with a low shot that was just wide of the far post. A goal was on the cards and it came n the 25th minute, following a foul on Reid. Ballyvolane packed the wall but, from 24 yards, Kelleher fired a beauty past it and low into the right hand corner of Condon's net. Ballyvolane woke up after that. In the 30th minute, Nugent forced a corner. Dave Keane swung it over, Jeremy Lettis headed on by the near post but skipper John O’Driscoll’s far post header, a difficult one, was a shade too high. Kanturk’s Kelleher was just off with a 32nd minute header from a Collins free and the home team equalised in the next minute. Nugent’s diagonal pass from left to right found Lettis steaming in by the far post. He had a poor enough angle but still managed to beat keeper O’Callaghan with a stunning shot. 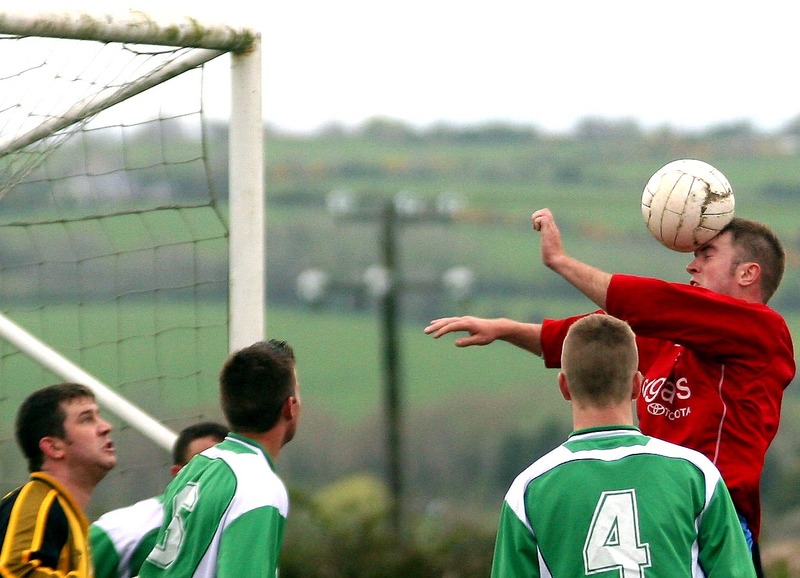 Ballyvolane were now on a bit of a high. In the 35th minute, a quickly taken free by Dave Keohane sent Guiton free to cross towards Keane but the striker made just very slight contact with his head and the ball ran wide. Soon afterwards, the Kanturk keeper saved an intelligent back flick by Cronin with some difficulty. With less than two minutes to go, Ballyvolane gifted a lead goal to their visitors. 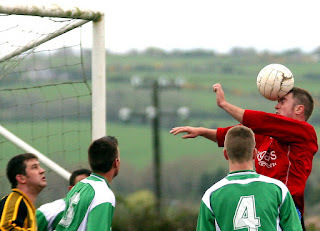 Kelleher, not by any measure the tallest man on the field, jumped in a forest of Ballyvolane players and his far post header ended up in the net, the final touches coming from home defenders as one, on the line, belted his clearance against the rear end of another. Not much doing in that dreary second half though Haugh did have to take a Nugent header off the Kanturk line in the 62nd minute and, in the 77th, home keeper Condon did well to intercept a Haugh cross before it could each sub Jason O’Sullivan. It was 2-2 in the next minute when Cronin's cross from the right swerved over the stranded keeper and into the net via the top of the far post. O’Callaghan’s fine winner, from a Haugh corner, came seven minutes later. Ballyvolane: Ger Condon, Mark O’Mahony, Dave Keohane, Dave Hickey, Paul O’Callaghan, John O’Driscoll (captain), Peter Nugent, Niall Guiton, Dave Keane, Martin Cronin and Jeremy Lettis. Subs used: Brendan Nyhan for Keane (57th minute) and Steven Byrne for O’Mahony (66th). Kanturk: Paudie O’Callaghan, Geoffrey O’Callaghan, Dan O’Mahony, John Lynch (captain), Noel O’Callaghan, Damien Kelleher, Tadhg Collins, Martin O’Riordan, Eugene O’Sullivan, Mick Reid and Jamie Haugh. Sub used: Jason O’Sullivan for Reid (50th minute).